Hey there! DDRKirby(ISQ) here with my post-mortem writeup for my chiptune rhythm game, Ripple Runner! Please check it out if you haven’t already done so! 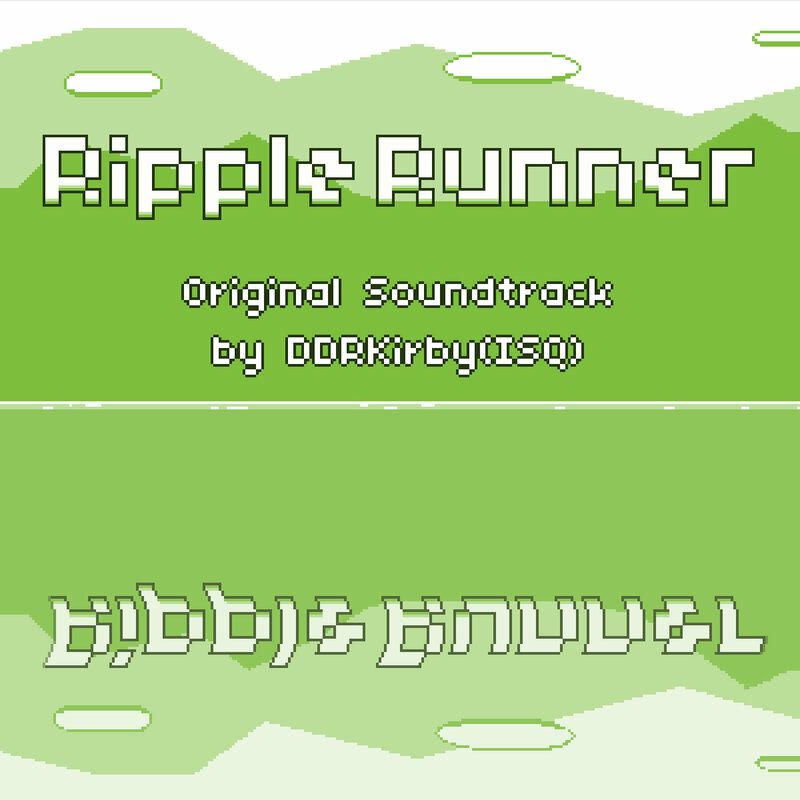 The title screen for Ripple Runner – Click to play! This is already my 7th time entering Ludum Dare…I’m really getting to be an old veteran now! Last time around I teamed up with my artist friend xellaya and made a puzzle platformer called Match Girl for LD28. You can read the post-mortem for Match Girl here, if you want to see how that turned out. Without further ado, let’s dive right into what went well and what didn’t go so well. I feel like I’ve been saying this ever since Hyper Furball, but the process of taking a game from start to finish has gotten really streamlined now, and now that I’ve got all of the basics down pat, I get to spend most of my work time on implementing the cool awesome things that are specific to the individual game, as opposed to writing lots of boilerplate code and worrying about menus, collision detection, how to recycle entities, particle emitters, screen flashes, etc. Ever since Hyper Furball, I’ve sort of had the same basic formula for the intro, title screen/menu, and jukebox as well, and I think that’s been working fantastically. Not only is it really easy to reuse the code from before and just adjust the menu slightly (as well as put in the appropriate background elements), but it also ties my works together aesthetically. Having the intro there (complete with shrot musical ditty) really gives it a sense of polish, and I’m really beginning to enjoy how I have it for each game I make. This is my favorite idea that I’ve ever had for an LD game, and I was actually REALLY excited when it all started coming together and I could see that it was going to work out. Because of various factors (which I’ll talk more about later), I actually spent quite a lot of time brainstorming different ideas for the theme this time (“Beneath the Surface”) and coming up with a bunch of different ideas, including a FEZ-like game that focused on water reflections, an extreme fishing game, a rhythm-based digging game, and a sort of 2D platformer version of Minesweeper (think Mr. Driller meets Minesweeper). In the end I think I was inspired to create a rhythm game by stumbling upon Rhythm Doctor in the few days leading up to LD, as I was brainstorming what kinds of games I would want to make this time around. Seeing that someone else had successfully made a music game using flashpunk was actually really encouraging–I now knew that it was possible! If I hadn’t seen that, I probably would have shied away from the concept, as music games are notoriously hard to really get right (I know–I’ve worked on one in the past as well). I think the in-game tutorial was one of the best gameplay design decisions as well, and definitely beats all of my other games in terms of easing new players into the game mechanics. At some point during my concepting, I decided that I was going to try out using a 4-color palette for the game. I knew I wanted something that would look good, yet also be relatively easy for me to do, since I’m pretty far from proficient in my art and pixeling skills. This turned out to be a great decision, as all of the graphics in the game were really simple for me to draw, yet the end result looked really great! Kudos to Plant Cat: First Blossom by flashygoodness and friends for getting me inspired to try this art style out. I also decided to go with a greenish hue, as a throwback to the good old days of the original Game Boy. This also made it easy for me do the hue-shifting effect that happens at certain checkpoints. Dirt simple! All I had to do was draw a solid shape with some variations at the top edge and make sure that it wrapped around nicely, repeat it for another shade, and then draw some super simple pixel clouds. The parallax scrolling effect is very simple to do in Flashpunk as well, by just making each image into an automatically-wrapping Backdrop that scrolls at a different rate. If you’re paying close attention during the game or at the title screen, you’ll notice that the white lines and dots on the surface of the water actually move, sort of imitating the bubbles and lighting that the surface of water makes in real life. I actually used two separate layers of white lines for this and made them scroll at different rates, so that it looks dynamic, as opposed to seeming like just a single image that’s scrolling. I implemented the wavy water reflection effect by modifying the “Glitch” filter in punk.fx to be based on a sin function instead of shifting lines at random. It’s a simple displacement effect that just shifts each horizontal line of pixels by a different amount, but it works really well! I’m really pleased with how the running animation turned out for my little guy too, despite being not confident at all that I could get that right. I had no idea what I wanted to make my character look like at first, and I actually still don’t know quite what it is (some kind of squid-like aquatic being?? ), but it ended up working out perfectly. I should note that even though I said I’m using a 4-color pallete, the final visual result of the game isn’t really constrained to that, because of the reflection effects and transparency and all that. Hence, the visual style of the game is very much “9-bit”, just like my music is–in other words, it’s derived from old 8-bit games, but doesn’t emulate them perfectly, and instead allows for some extra capabilities. The Ripple Runner OST – click to download! This certainly isn’t the first time that I’ve had real life issues distract me or come into conflict with Ludum Dare, so it’s not like this was any surprise to me, but sheesh…just once I’d like to just do a Ludum Dare without getting sick or being mentally exhausted or having my timeslot screwed over in some way. This time around I left my Friday dance event early so that I could have a bit more time to focus on LD (I was too distracted to really think about anything else anyways), but as luck would have it I needed to go perform for something on Saturday at around noon, so that ate up the first half of my Saturday. I brought myself a pen and paper so that I could spend my downtime brainstorming ideas and concepts for the game, which actually ended up working out pretty nicely, but in the end I didn’t get to sit down at my computer and start working until 4:30PM on Saturday, which is over 20 hours into the 48 hour timeframe. Soooo yeah, I kind of got screwed over in terms of time. On the plus side, having all my ideas planned out as well as being all anxious from having lost out on a half-day of work made me blaze through the initial dev work and I had the basic game up and running very quickly (after a few hours of work), so it wasn’t the end of the world…but I’m pretty sure I would have been able to program more content and make more songs if it wasn’t for me having lost out on all of those potential work hours. Here is a good time to note that I actually didn’t implement the spike mechanic until preeettty late into development (At t-minus 5 hours or something like that). After making the first two stages, I was thinking to myself that it would really be nice if I had a third mechanic, as only having jumping and swapping was fun but also not quite that interesting from a gameplay perspective. Three is kind of the magic number for having different things to concentrate on, as I know from playing Puzzlejuice, so I was looking for something different to do. In the end I came up with two different ideas–one was the spike/flip upside-down mechanic that I ended up implementing, and the other was that I was going to have the Jump button do an attack or kick of some sort if you pressed it in midair, so that you’d have to press jump twice in quick succession to get past certain obstacles (breakable walls or something). I wanted to implement both, but in the end didn’t have time, so I just went with only the spikes. I knew that that was the better of the two mechanics anyways, because holding a button down is a different feeling than the button presses for jump and ripple, both mentally and from a tactile sense too. The jump-kick idea would let me introduce more eighth-note rhythms into my songs, but I already kind of had that idea going with the jump-ripple combo, so it didn’t -really- introduce anything new. Like I mentioned above, a direct corollary of having less time was only being able to make 3 songs for the game, even though I had definitely wanted to make more. Programming in the actual stages was actually quite time-consuming, as I had to make sure all of the platforms and obstacles were mapped to the appropriate times in the music, as well as placing special events such as checkpoints, hue shifts, changes in scrolling speed, and tutorials. Thankfully this wasn’t actually -too- bad, but every once in a while (typically when I went to import a source file from Match Girl or something and was trying to rip out all of the Match Girl-specific parts), FD would have problems with the compile process–it would either fail to detect changes, or just tell you that the compile succeeded and then try to run the resulting binary, when in actuality the compile was supposed to fail (because of a missing import or something). Again, this happened only once or twice, and I had some workarounds, but it was a bit of an annoyance when it did happen. Other than that, my development was actually really smooth this time around, with no real surprises anywhere. I remember having issues trying to get the ripple particle effects working properly, but I ended up figuring that out without too much pain. Overall, Ripple Runner was a huge success, personally, and I’m really looking forward to what you all think of it as well. Again, please play and rate if you haven’t done so already! I’m also definitely looking into working on a post-compo version of Ripple Runner, cleaning up a few things like adding the ability to pause the game, etc. Mostly, though, I just want to add more songs, because 3 just isn’t enough! I also want to give songs that have a wider difficulty range…the 3rd song isn’t nearly hard enough to give players a *real* challenge. Stay tuned for news on the post-compo version–I’m hoping to work on it over the next couple weeks! This entry was posted on Sunday, May 4th, 2014 at 10:43 pm	and is filed under LD #29. You can follow any responses to this entry through the RSS 2.0 feed. You can skip to the end and leave a response. Pinging is currently not allowed. Can’t wait to see a post-compo version.